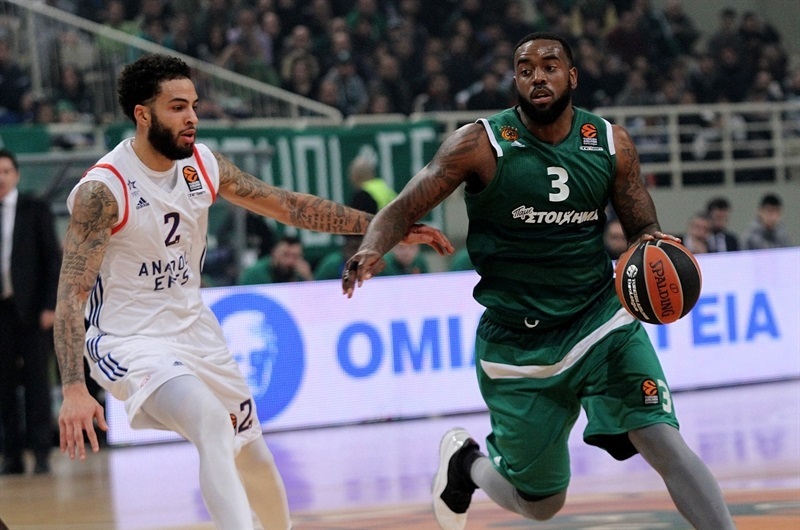 Panathinaikos Athens survived some high drama at the end of the fourth quarter before rallying to beat Anadolu Efes Istanbul 92-81 in overtime on Friday night in the Greek capital. 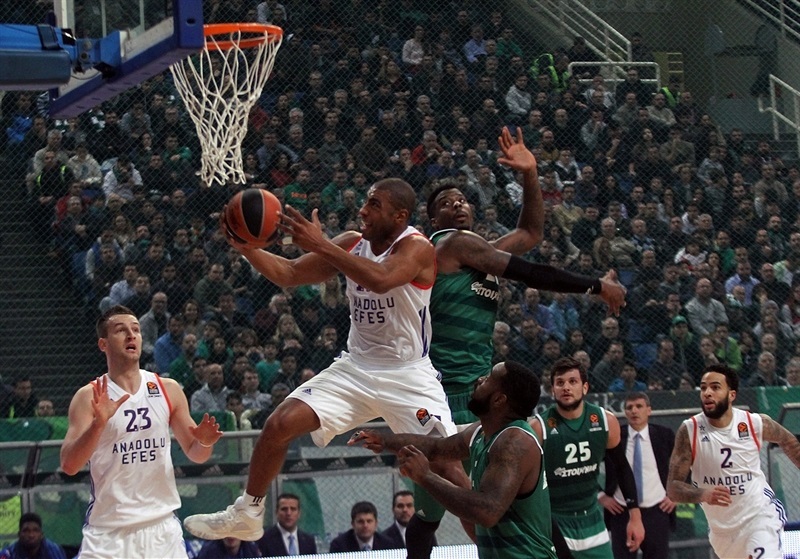 Efes won the first meeting against Panathinaikos in double-overtime earlier this season, and in this game Efes was up 67-70 with 7 seconds to go. But Mike James drew a foul while in a shooting motion behind the three-point arc, and went on to make 3 of 3 free throws with 4 seconds left in regulation time, forcing the extra session. 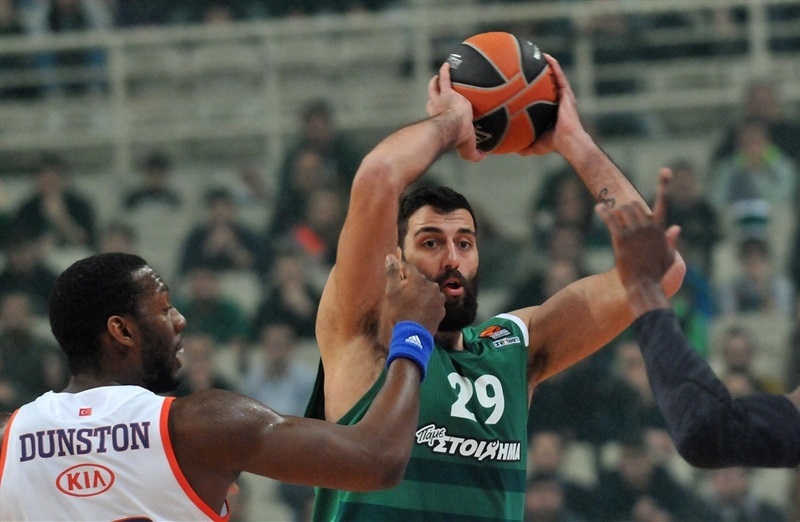 In overtime, Panathinaikos dominated and raced away to a victory that boosted the Greens to a 10-7 record, while Efes dropped to 8-9. Since both head-to-head matches of these two teams ended in overtime, neither team holds a tie-break advantage if they finish with the same record at the end of the regular season. K.C. Rivers starred with 23 points on 5-for-10 three-point shooting. 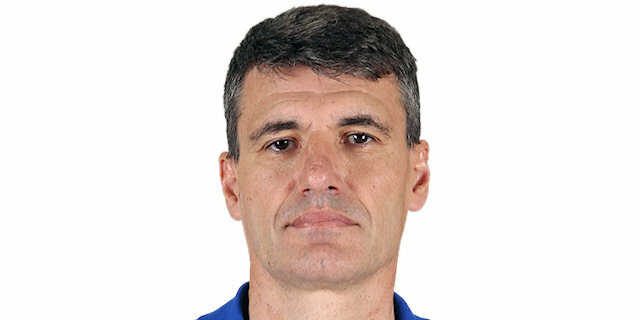 Alessandro Gentile scored 13 of his 15 points in the first quarter; Mike James and Ioannis Bourousis had 14 points apiece; and Kenny Gabriel had 10 points in victory. 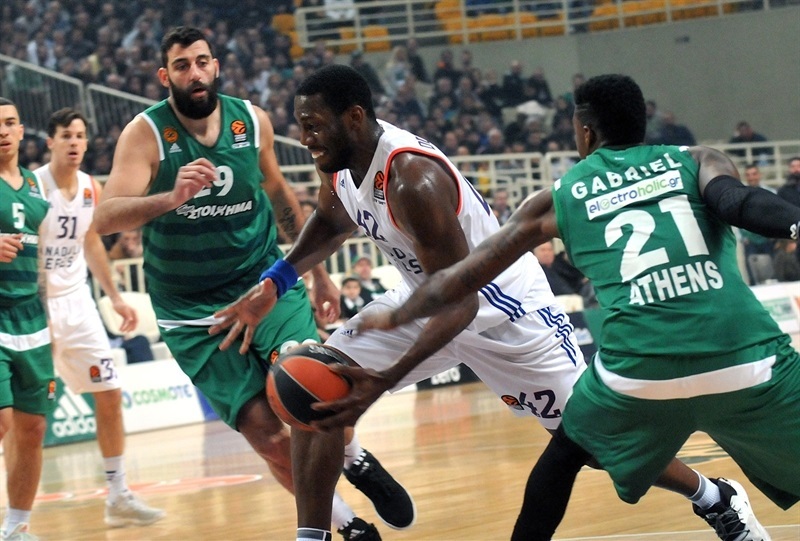 Thomas Heurtel had 15 points for Efes, Jayson Granger netted 14, and Derrick Brown 12 points. 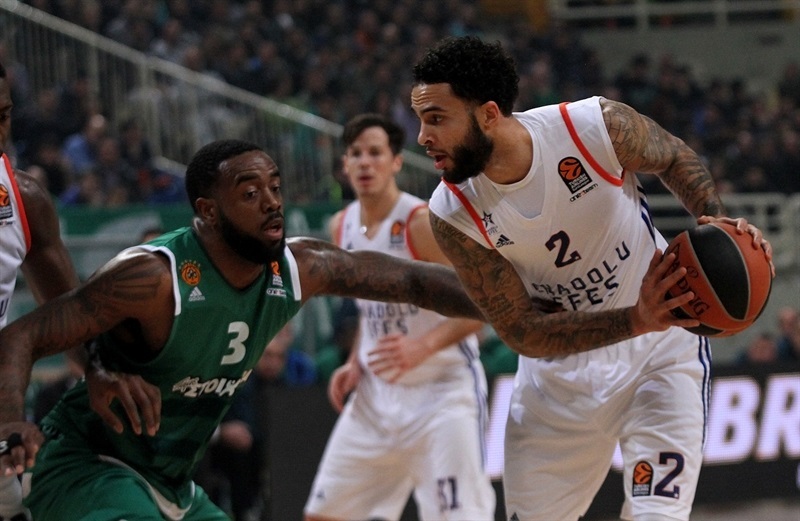 Tyler Honeycutt collected 11 points and 12 rebounds, and DeShaun Thomas also scored 11 in defeat. 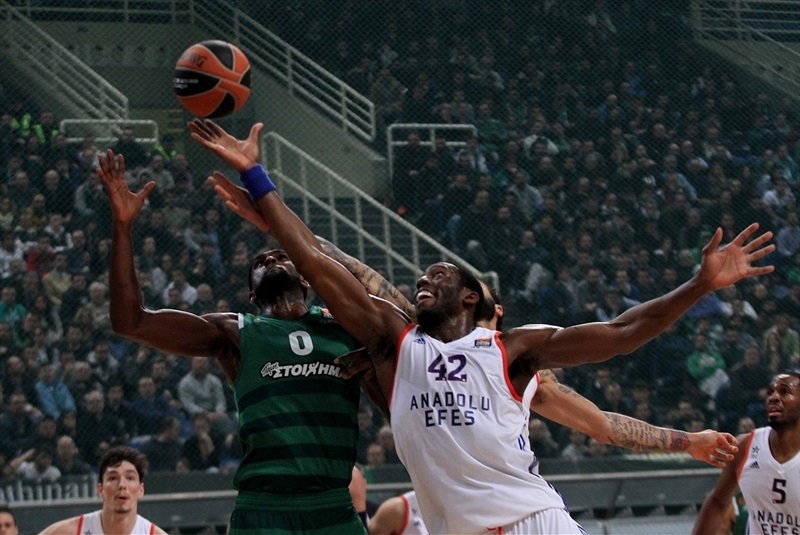 Panathinaikos started solid defensively, as Efes needed six trips down the floor to start its scoring. But the visitors scored 7 in a row with Granger's three-point play making it 5-7. 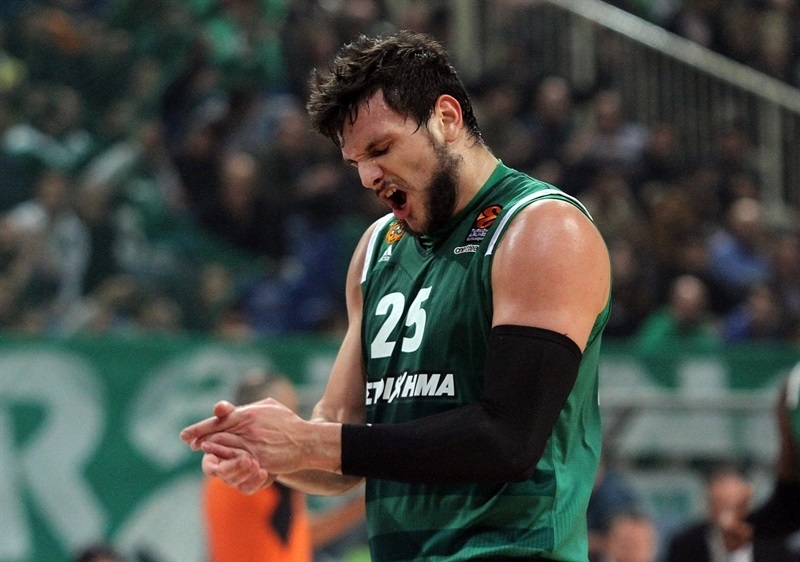 However, Panathinaikos was in control, thanks to grabbing 5 offensive boards and to Gentile scoring 13 first quarter points. Gentile's long jumper and a three-pointer on back-to-back possessions made it 16-9, before Nick Calathes set up a buzzer-beating triple from Rivers that gave the hosts a 21-13 advantage after one quarter. Rivers and Bourousis scored inside to open up a 25-13 lead in the second, but back-to-back threes from Thomas and a floater by Heurtel helped cut the difference to 27-23. 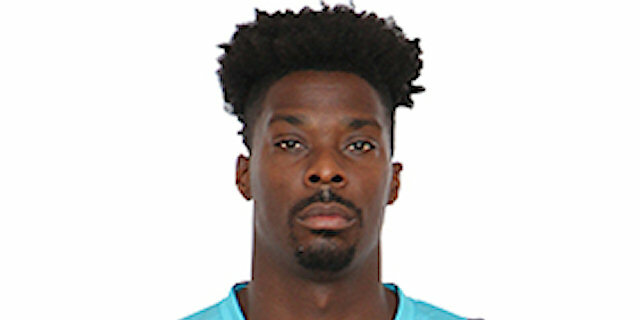 Rivers hit a transition triple, before Antonis Fotsis and Demetris Nichols each hit from downtown, too, extending the Panathinaikos lead to 38-25. 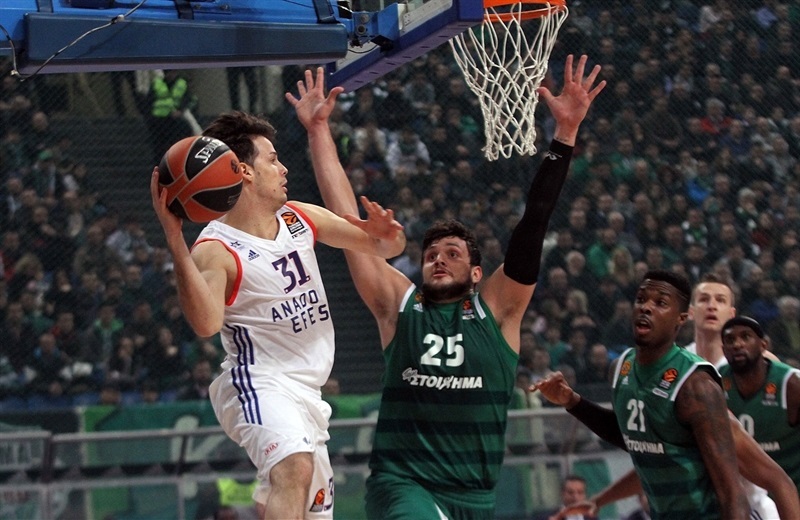 Efes scored the final 7 points of the half, cutting the deficit to 38-32 at halftime. Cedi Osman opened third quarter with a triple that cut it further. 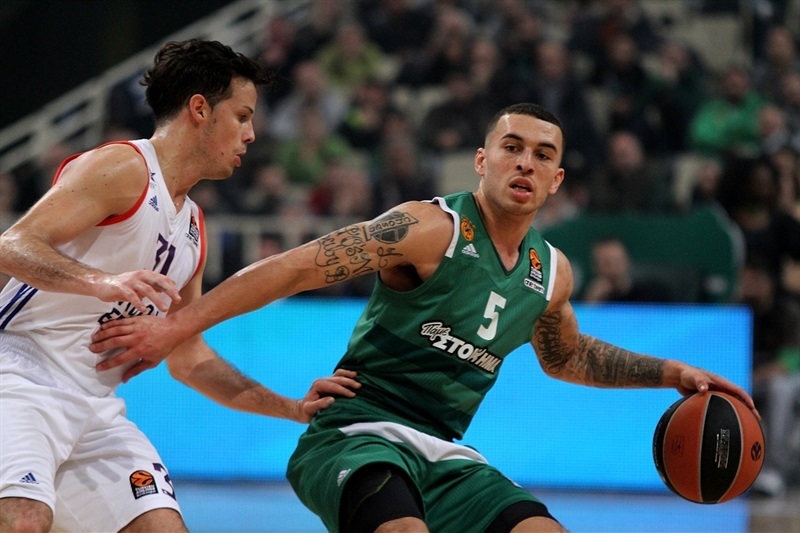 Calathes and Gentile gave Panathinaikos more breathing room, and a jumper by Mike James made it 48-41. Back-to-back threes from Granger and Brown got Efes within 48-47 before Heurtel's driving layup capped a 0-9 run late in the third, giving Efes the lead. 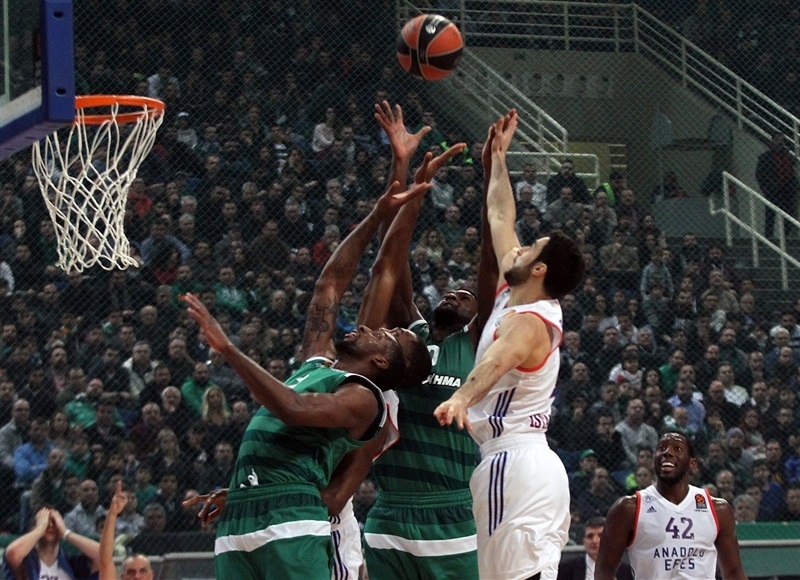 Bourousis forced a tip-in to tie it at 50-50, a score that stood after 30 minutes. The teams traded blows in the final quarter of the regulation time. James made a high-arching floater to make it 58-55, but Brown drove for a big one-handed slam to put Efes in front, 60-61. In the final 70 seconds, Rivers and Heurtel traded three-pointers, and Efes looked as though it has control of the game. Brown made a pair of foul shots to make it 67-70 with 7 seconds on the clock, but James drew a personal foul and 3 free throws, making them all with 4 seconds to go, forcing overtime. In the extra session it was all Panathinaikos, as the visitors were held without a field goal for the first 4 and a half minutes. Meanwhile, Bourousis, Rivers and Gabriel opened a 82-72 lead, and the hosts closed out the game. "We needed to close the game in the end of second quarter. We were up by 12, and in the last minute and a half before halftime they made a run of six points. In the second half it was clear that it was a game of point-by-point, and in the extra time we played very well. We scored our open shots and controlled the game." "This game is a tough loss. We played 40 minutes good basketball. We gave up in overtime, and played bad in overtime. Critical decision is three free throws given to James… We don’t understand that decision... 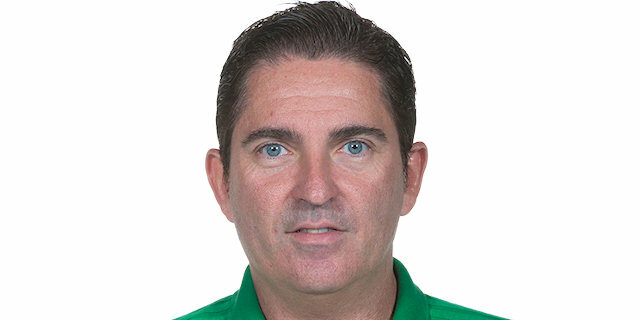 But, I must congratulate Panathinaikos because they believed in victory, and they finally found a way to win. 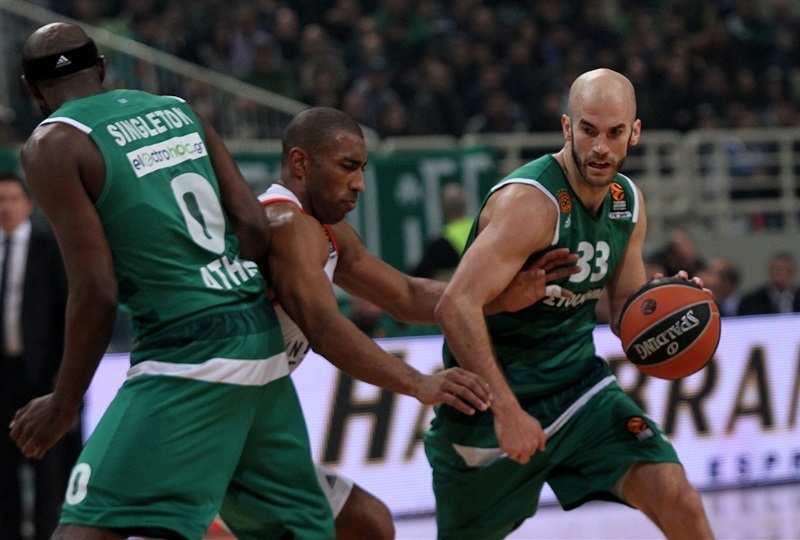 We had problems with offensive rebounds of Panathinaikos, and that was the key." "Today it went well for us. We fought through adversity, and had to build a little bit of character today. But most importantly we came together and got a win. It was tough, we had the lead in the first half, and second half, but once we got to overtime we told each other we are not going to lose the game. That's the fight you need to have as a team. We just came together, and we built off of the four quarters. The last five minutes we really wanted to win, because we knew how important the game was for the fans, to the coaching staff, and all 16 guys in the locker room. We fight every day in practice, and I think we are becoming a great team night in and night out."